President Donald Trump wants Patriots owner Robert Kraft to join his players at the traditional White House celebration for their Super Bowl championship this spring despite Trump aides' worries about the controversy surrounding Kraft after being charged with soliciting prostitution, POLITICO reports. White House officials told POLITICO they consider it a bad idea for Trump to host Kraft for a celebratory event at the White House, where it has become customary for presidents to honor championship sports teams. A senior White House official also told POLITICO that the President has spoken to Kraft since the Patriots owner was charged last month in Florida. Kraft, who faces two charges of soliciting prostitution, denied any illegal activity in his initial statement and pled not guilty last month. He reportedly rejected a plea offer from the Florida state attorney's office that would drop his charges if he admitted he would have been proven guilty in court. 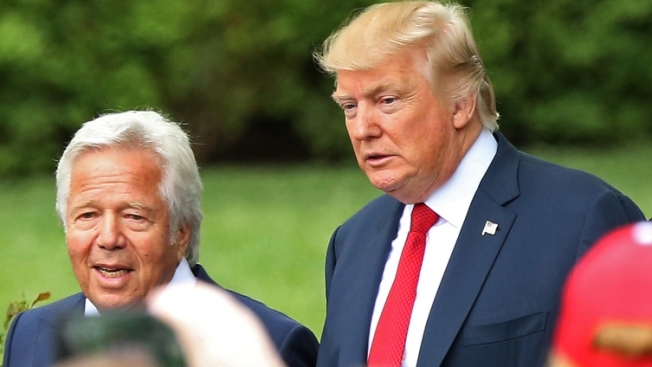 Trump aides told POLITICO they have not expressed their concerns about inviting Kraft to join the team at the White House to the President because he has stood by Kraft, a longtime friend of the President, since his charges ("He's proclaimed his innocence totally," Trump said) and has told aides he wants the Pats owner there. "But I would bet that he comes," one official told POLITICO. "He's synonymous with the team. He's accused, but he hasn't been convicted." Three Patriots, twin brothers Jason and Devin McCourty and Duron Harmon, have said they will skip the White House visit this year. A date has not been set. The World Series champion Red Sox are scheduled to visit the White House May 9. In April 2017 when Trump hosted the Pats after their Super Bowl 51 victory, 34 of the 68 invited players attended, along with Kraft, coach Bill Belichick and several team officials.